Time: Registration opens at 8.am, start at 9am and finish at 4.30pm with refreshment breaks. FODMAPs is an acronym, that refers to Fermentable Oligosaccharides, Disaccharides, Monosaccharides and Polyols. FODMAPs are small chain sugars and fibres that can be poorly digested and may contribute to a range of digestive symptoms including those linked to SIBO and IBS. The low FODMAP diet originated in Australia and was developed by a team at Monash University in Melbourne. The low FODMAP diet is increasingly implemented to help minimise IBS and functional bowel symptoms symptoms. Following a low FODMAP diet can be a challenge without the help of a FODMAP knowledgeable practitioner. This practical therapy day will focus on providing you with the tools to further support your clients with meal plans and recipes and relevant skill sets. Learn what the low FODMAPs Diet is, and what it means in terms of food restrictions but also what alternative foods to eat. Learn about studies which have incorporated the low FODMAPs Diet and their outcome. Learn about the mechanisms and potential efficacy of the low FODMAPs Diet. Learn about identifying for whom the low FODMAPs Diet may be appropriate. Learn about how to support and correct the underlying gut imbalances in those individuals who benefit from a low FODMAPs diet. Receive an information booklet / patient handout giving details of the low FODMAP diet, menu example and the most recent information on foods to avoid, with suitable alternatives including recipes and advice on reading labels and eating out. 9.15 am – CB The low FODMAPs Diet is, and what it means in terms of food restrictions, and what alternative foods to eat. 10.00 am – AH Review of studies which have incorporated the low FODMAPs Diet and their outcome. 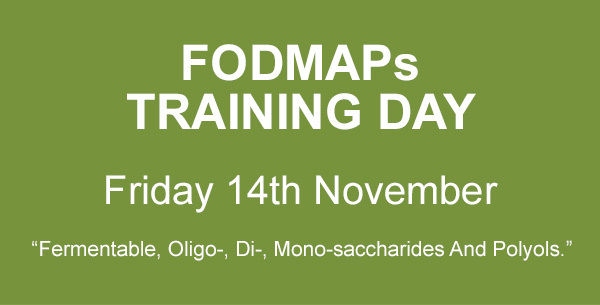 10.20 am – AH The mechanisms and potential efficacy of the low FODMAPs Diet. 11.30 am – CB Fructose malabsorption and lactose intolerance. Testing Options, Key foods to avoid and alternatives for clients. 12.15 pm – AH How to identify who needs the low FODMAPs Diet. 12.45 pm – AH Part I How to support and correct the underlying gut imbalances in those individuals who benefit from a low FODMAPs diet. 2.15 pm – AH Part II How to support and correct the underlying gut imbalances in those individuals who benefit from a low FODMAPs diet. 2.45 pm – CB Practical implementation of a low FODMAPs diet with clients with a focus on tailoring the diet for those following specific diets e.g vegetarian, vegan, autoimmune paleo. 3.30 pm – CB How to conduct the recommended re-introduction programme with clear step by step guidelines. This course is designed for qualified practitioners and clinicians who wish to expand or refine their existing skill sets in the use of exclusion or inclusion nutritional programmes along with other interventions to optimise the rcovery from functional GI problems. The low FODMAPs approach will be put into perspective with regard to other dietary approaches for digestive conditions, and this includes the Specific Carbohydrate Diet (SCD) and the GAPS diet. You will learn about how to help support individuals who need to follow this type of exclusion diet and how to help them return to a fully functioning digestive tract. This will include suggestions for how to support gut lining integrity, mucosal tolerance & digestive function as well as measures to temper chronic sympathetic overload (CSO) which is a common feature of many digestive conditions. You will be taught about specific supplements to consider for those with SIBO and IBS symptoms. Places are very limited, please call 08450 760 402 to book your place.